BETHESDA, Md., Oct. 31 /CSRwire/ - Lockheed Martin has partnered with Discovery Education on Generation Beyond: Aviation, a digital STEM curriculum that takes students behind-the-scenes with Lockheed Martin engineers and scientists to solve real-world technology challenges, from fighting wildfires to making flight suits for military pilots safer. Learn more about the new Generation Beyond: Aviation curriculum: www.generationbeyondinschool.com. 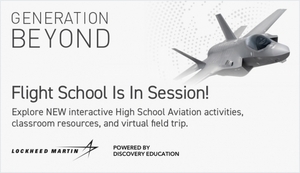 Through video challenges, a virtual field trip at Lockheed Martin’s famous Skunk Works® and surprise STEM lab takeovers in select U.S. high schools, the Generation Beyond: Aviation curriculum will engage students in learning about a range of cutting-edge technology areas, applying critical thinking skills, discovering the exciting work a STEM career can offer and hearing directly from people who are doing that exciting work today. Learn more about Lockheed Martin’s Generation Beyond STEM education program. Learn more about Lockheed Martin’s commitment to STEM education.